The PacSafe Citysafe CX Convertible Crossbody is perfect for any occasion and any destination. Anti-theft features include an adjustable shoulder strap. The CitySafe possesses slashproof side and bottom panels and shoulder strap clips around a secure fixture. The PacSafe CitySafe CX offers a tamperproof zipper and a RFID safe-blocking pocket to safeguard your identity and personal information. The Citysafe CX additional features as main zippered pocket, head phone port, zippered front pocket, card slots and a key clip and pen holders. Strap Length : 21.65" - 28.34"
Volume : 305 Cubic In. 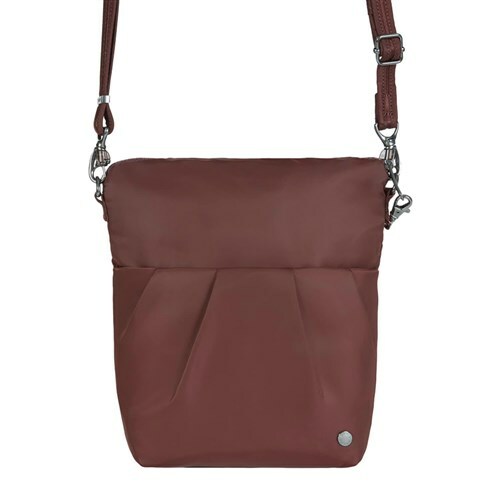 The Pacsafe Citysafe CX Convertible crossbody-Merlot has many exciting features for users of all types. 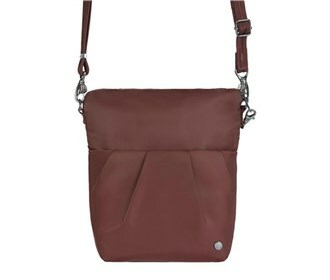 See the Pacsafe Citysafe CX Convertible crossbody-Merlot gallery images above for more product views. The Pacsafe Citysafe CX Convertible crossbody-Merlot is sold as a Brand New Unopened Item.